By placing beryllium in intimate contact with an alpha-emitting radioisotope, neutrons are produced. At home, one can approach this well-known reaction by lining up the sealed americium sources from a quantity of old-fashioned ionization smoke detectors on a sheet of beryllium metal. The neutron yield is easily detected; see this link for more information. My own toy AmBe neutron source currently produces an estimated 1000 neutrons per second. That makes it more than three orders of magnitude weaker than my Farnsworth Fusor. But are there enough neutrons to perform some detectable nuclear reactions? As it turns out…yes. Neutrons give rise to prompt gamma rays when they are captured by many nuclei. The following experiments involve the detection of high-energy (> 4.4 MeV) gamma signatures from neutron capture in chlorine, iron, and titanium, in the form of inexpensive and readily-available compounds mixed with water and placed near the 1000 n / s AmBe source. A gamma ray spectrum is collected with a very efficient scintillation detector (2×2″ BGO) over a period of hours. For the chlorine experiment, a 40 lb. bag of rock salt was purchased at Lowe’s for about $4. A two-gallon pail was filled to the brim with salt, followed by successive additions of water and more salt to obtain the highest chlorine density possible. A piece of PVC pipe, capped on the bottom, enters the salt pail from the top. The neutron source fits down in this pipe so that it is nearly surrounded on all sides by salt. 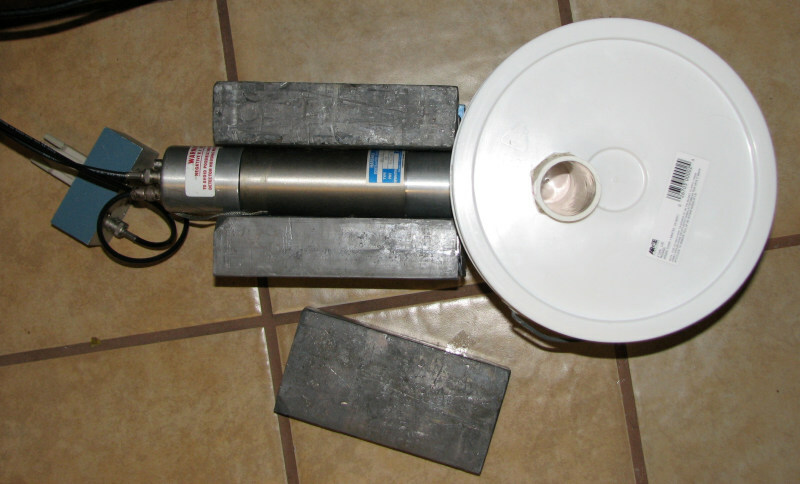 The lead-shielded BGO scintillator views the side of the pail at the level of the source. 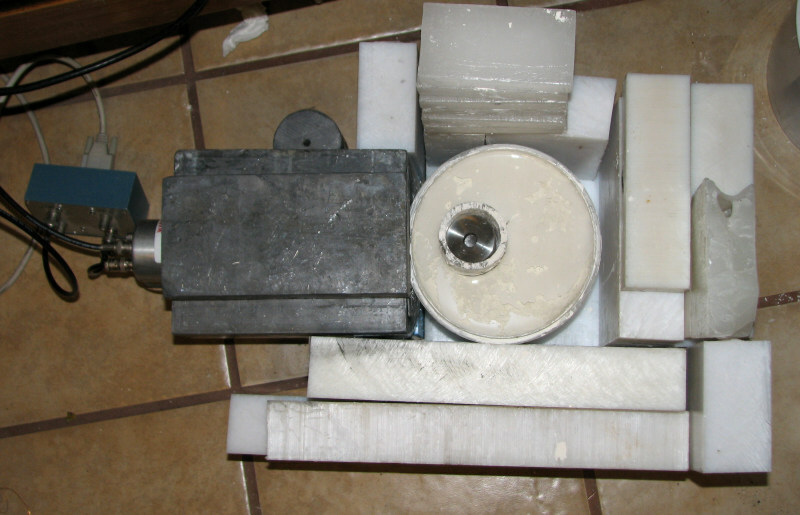 The iron experiment is similar, except the medium in use is 10 lb. of ferrous oxide (FeO) purchased at New Mexico Clay here in Albuquerque. The oxide is divided among two PETE jars and water is added to wet the oxide, drive out air, and fill the jars. 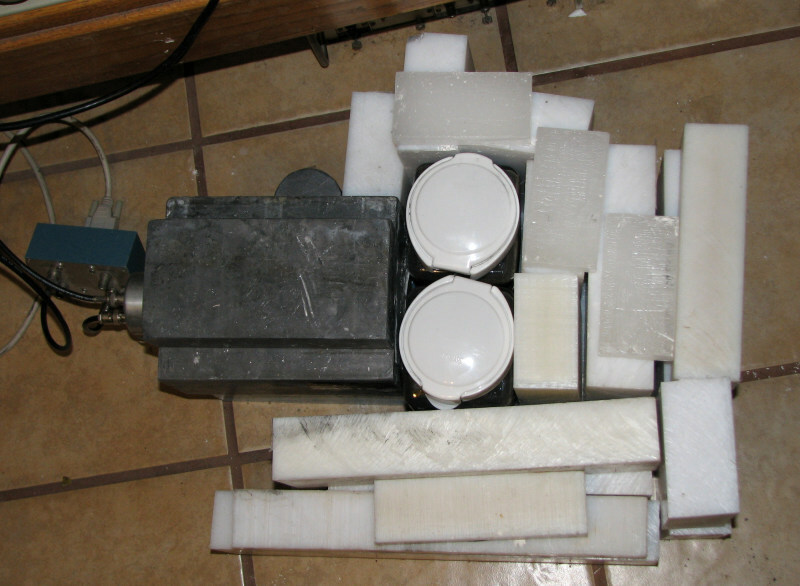 The neutron source is taped behind one of the jars and the assemblage is surrounded by UHMW-PE bricks to act as a neutron moderator / reflector. Titanium was obtained in the form of titanium dioxide powder from New Mexico Clay. Enough dioxide (~8 lb) was loaded into a large cylindrical Rubbermaid food-storage container to fill the sonofabitch. Water was added to displace air and top off, and as before, PE bricks were arranged around the outside. In this instance the neutron source sits in an acrylic tube penetrating the TiO2 from the top.